Mulberries, from the Morus alba tree, are a naturally sweet fruit that look similar to blackberries and taste like grapefruit. The skin is smooth and fragile but as the fruit ripens, the colour changes from green to red to dark purple. Its leaves, which also contain nutrients, are thin, glossy and light green. Mulberry leaves have traditionally been used in the Orient as herbal medicine, used to prevent and treat many health conditions, including cold symptoms, blood vessel problems, and diabetes. 2-4 ml per day of fruit syrup is full of vitamins, minerals and anti-oxidants. 4.5 to 15 g daily of mulberry leaf tea, depending on the condition being treated. Mulberries can be grown from seed, and this is often advised as seedling-grown trees are generally of better shape and health. But they are most often planted from large cuttings which root readily. 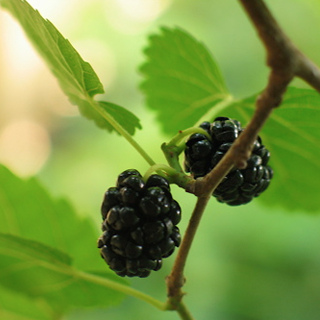 The ideal time for fresh mulberries is from May through August. Pick leaves as necessary throughout the year.